Amendment: It was pointed out to me - correctly - by a former colleague that my use of the term "civilians" includes many members of the intelligence community. They certainly contributed to the war effort and I did not mean to include them in any disparaging comments. President Barack Obama delivered a nineteen minute address tonight declaring the end of American combat operations in Iraq. Over the last few weeks, the Administration has sought to take credit for the military success that led to this event - the surge of 2007 and 2008. Most of the rhetoric has emanated from Vice President Joe Biden, with some support from Secretary of State Hillary Clinton. The President said that "we persevered." I wonder who "we" is, since all three - Obama, Biden and Clinton - opposed the surge that led to the ability of American forces to turn over the fight to the Iraqis. While in the Senate, this trio voted to not fund the surge and demanded the premature withdrawal of American forces. To me, that borders on hypocrisy. The President doesn't get it. Although the President rightly praised American troops for their "courage and resolve," he could not pass up the chance to belittle their sacrifice with the statement that success was due to "our troops and civilians." Mr. President, it was our men and women who wear the uniform, most of the time with body armor and weapons, that carried the day, not your beloved diplomats. If it was up to some of the diplomats over at State Department, we would have quit the fight years ago. See my earlier piece, What is the favorite wine over at State Department? The statement that operations in Iraq will continue with "our dedicated civilians in the lead" is ludicrous. American policy in Iraq will be shaped by the 50,000 American troops still in the country. Make no mistake - there is considerable combat power still there. Several heavy brigade combat teams have been renamed as "advise and assist brigades." The units have the same TO&E (table of organization and equipment) and soldiers from these brigades have told me that they still conduct the same missions "outside the wire." Mr. President, you can't declare victory and go home. Even worse, you can't continue your administration's dangerous practice of conducting military operations on a politically-driven timetable. Your comment that what we are witnessing is the execution of a promise made in February is telling. This is not a political campaign, this is American foreign policy. It gets better - sorry, I mean it gets worse. President Obama, you reaffirmed yet again that all American troops will depart the country by the end of 2011. Haven't you learned yet that these artificial deadlines put our troops at risk? Even your own generals have said that these dates are "giving our enemy sustenance." See my earlier piece, Afghanistan and that pesky withdrawal date. There are a host of problems in Iraq, not the least of which is the failure of the politicians to form a new government based on the elections seven months earlier this year. I am very disappointed that Iyad 'Alawi has been unable to form a coalition with himself as prime minister - he certainly is the best hope for a unified Iraq. What we do not need is continued American support for the current prime minister Nuri al-Maliki. Al-Maliki claimed that Iraq was now an independent nation following the rhetorical withdrawal of American combat forces. Al-Maliki is an ungrateful puppet of the Iranians. His nickname - Nuri al-Irani (Nuri the Iranian) says it all. Of course, no President Obama address would be complete without a reference to Afghanistan and our mission to "disrupt, dismantle and defeat al-Qa'idah." He's getting better at understanding that al-Qa'idah is no longer a major presence in Afghanistan - he actually talked about the Taliban. Now he needs to work on why we need to defeat the Taliban, but that's a discussion for another time. The most egregious statements about Afghanistan again concern his artificial deadlines. 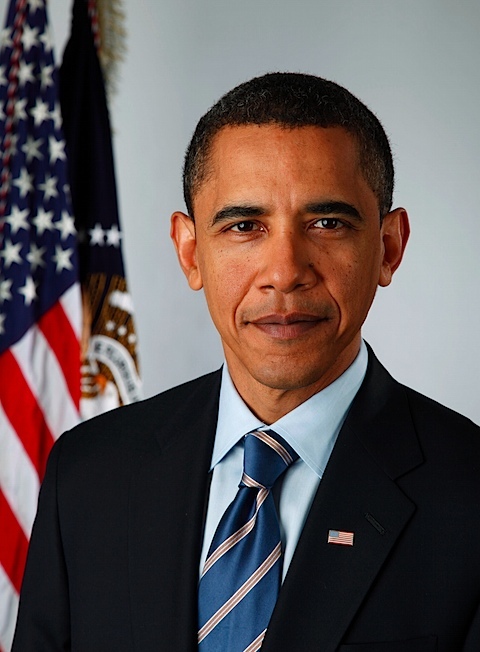 As with his statement on Iraq, he reaffirmed his commitment to a transition in Afghanistan on July 31, 2011. Transition is Obama/Biden-speak for withdrawal. As Biden recently said, "In July of 2011 you're going to see a whole lot of people moving out. Bet on it." That does not sound like conditions-based analysis of the situation, it sounds like a campaign promise. I also found it interesting that the President opened his remarks with the domestic agenda - "we need to rebuild our nation at home." He also came back to that same theme later on with comments about the middle class and almost ventured into the "blame Bush" rhetoric that most Americans have tired of some time ago. I was pleasantly surprised with his analysis of what it will take to resolve our domestic challenges and thought that he almost sounded like a capitalist. Maybe there is hope for change after all. As far as Iraq and Afghanistan though, he just doesn't get it. Anyone who has had access to any form of media over the last few weeks is aware that Iranian and Russian technicians have begun loading uranium fuel rods into the nuclear reactor at Bushehr, a port city in the northern Persian Gulf. While much has been made of this reactor and possible ties to a suspected (and fairly well accepted) Iranian nuclear weapons program, the Bushehr reactor is under International Atomic Energy Agency (IAEA) safeguards. 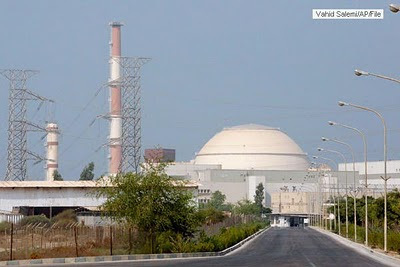 Theoretically, the fuel for the Bushehr reactor will be supplied by the Russians, and spent uranium fuel rods will be returned to Russia for disposal or further processing - but will not be available to the Iranians. There are IAEA inspectors at the plant to make sure this happens. It is important that the inspectors do their jobs - the reactor will produce as a byproduct of its operations a fissile isotope of plutonium, plutonium-239 (P-239). P-239 is the primary fissile isotope used in the manufacture of nuclear weapons. Given the Russians' track record in dealing with the Iranians and Moscow's loose interpretations of the United Nations sanctions protocols against Iran, it is imperative that the IAEA ensure that Iran does not have access to the spent fuel. That access would catapult their nuclear weapons program - a program they deny but virtually no one believes them - to an almost instant weapons capability. I was startled to see almost no world reaction to an Iranian proposal last week that the Iranians and the Russians share the control of the fuel cycle for the Bushehr reactor. This is ludicrous. The Iranians have shown no willingness to cooperate with the rest of the world on their uranium enrichment program - now they want to enter into a joint operation with the Russians for a reactor that produces the world's most dangerous nuclear isotope. You have to give them credit for trying. I hope the rest of the world - especially the P5+1 (the five permanent members of the UN Security Council plus Germany) - see this for what it is: access to weapons grade fissile material. Iran's efforts to acquire nuclear power generation capability and a nuclear weapons arsenal are not lost on its neighbors to the west. Of course, its neighbors to the east - Pakistan and India - already possess nuclear weapons. 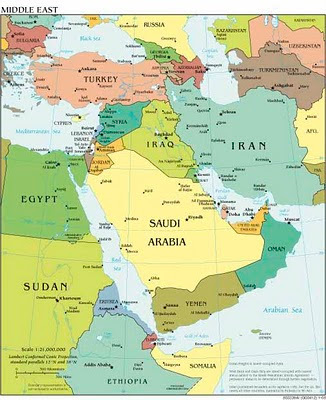 The Gulf Arab states as well as other nations in the region are concerned with Iran's aspirations to be the dominant power in the region. Iran is not only developing a nuclear weapons capability, but the ballistic missiles with which to deliver them, and a host of new conventional weapons to defend against any attempts to halt their progress. Let's take a look at what the Iranian nuclear program has spawned or re-energized. Keep in mind that unlike the United States and its World War II Manhattan Project to develop the atomic bomb, nuclear energy programs are usually the first step towards a nuclear weapons capability. Egypt has just announced the construction of a nuclear power plant at al-Dabah on the Mediterranean coast about 100 miles west of Alexandria. Although this will be a power plant, the words of Egyptian head of the International Center for Nuclear Weapons at the United Nations are telling: "Egypt will not enjoy its sovereignty unless it has the strength to implement a just peace...I am of the opinion that possessing an atom bomb is essential if you want to enjoy power and sovereignty." Egypt proposes to have four plants operating by 2025 in addition to its existing two research reactors at Inshas. Could there be a nuclear weapon program hidden in there? If Iran has nuclear weapons, Egypt - which regards itself as the leader of the "Arab nation" - certainly will develop them as well. The Kingdom of Saudi Arabia announced the development of the first nuclear power plant in the Gulf Arab states - it will supply electricity to portions of the capital, Riyadh. Saudi Arabia and Iran are competitors for the role of key power broker in the Persian Gulf. If Iran has nuclear power, then the Saudis will want it as well. If Iran has nuclear weapons, Saudi Arabia will certainly procure them as well. Notice I said procure. The Saudis will likely attempt to purchase the weapons rather then develop them on their own. That in itself opens up yet another proliferation can of worms. - Even the small Hashemite Kingdom of Jordan has decided to build nuclear power plants. Oil-poor Jordan actually has a need for an electrical power generation capability. The first reactor is planned for the al-'Aqabah area, with three additional plants to transform the country into an energy exporter. - Turkey has two proposed nuclear power plants to be built by Russia and South Korea. This will augment their three research and one fuel production facility. Turkey is an interesting case as it draws closer to Iran. Turkey and Brazil attempted to broker a deal whereby Iranian enriched uranium would be sent to Turkey in exchange for nuclear fuel. Other countries in the region also have small, purely research reactors: Algeria, Libya, Morocco and Syria. Of course, Syria attempted to secretly build a large reactor out in the northeastern desert area called the Jazirah. 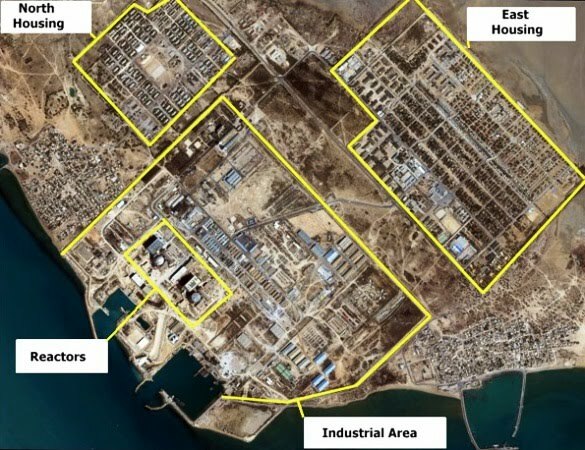 It is believed that the reactor was being built with North Korean assistance - and possibly Iranian funding. Israeli fighter aircraft destroyed it in September 2007. That reactor was almost certainly part of a clandestine nuclear weapons program. As Iran continues to develop its nuclear programs - power and weapons - it is only logical for other nations in the region to do the same. It is just a matter of time before we see more nuclear-armed states in this volatile region. This is the "fallout" of Tehran's program. Within the space of just two days, two American general officers have made contrasting remarks on the July 2011 withdrawal date mandated by President Barack Obama. Military officers, or more correctly, military officers without a political agenda, regard these artificial, arbitrary and politically-motivated timelines as dangerous. They unnecessarily put our troops at risk and jeopardize the mission. General James Conway, Commandant of the U.S. Marine Corps, said that a specific date gives "sustenance" to the Taliban. His words: “In some ways, we think right now it’s probably giving our enemy sustenance….In fact, we’ve intercepted communications that say, ‘Hey, you know, we only have to hold out for so long.’” He quickly sought to soften those remarks - after all, he is still a serving military officer and is expected to toe the Administration line whether he believes it or not. Obviously, he does not. General Conway is absolutely correct in his analysis. Of course when the Administration announces that it will begin a troop withdrawal from Afghanistan in July 2011, the Taliban assesses that the Americans are not in this to the finish, that at some point they will pack up and go home. It was Ho Chi Minh who once said that Americans soon tire of the fight and go home. I fear his words spoken decades ago may be accurate today. What the President and his generals need to say is very simple, "American troops will not withdraw until our objectives our met. We will continue to hunt you down and kill you unless you give up the fight." We need to convey to the Taliban that we are in this to win, not merely to score political points at home. This needs to be about victory in the war on terrorism, not victories in elections in the United States. As it stands now, the Taliban believe that their victory begins in July 2011. Once President Obama has merely floated the idea of a withdrawal date, it will be difficult to back down from that position. It is further compounded when the Vice President makes off-the-talking-points remarks like, "In July of 2011 you're going to see a whole lot of people moving out. Bet on it." Granted, Biden is not in the chain of command* (neither is Conway for that matter), but he supposedly has the ear of the President. Any wonder the Taliban questions our commitment to winning in Afghanistan? General David Petraeus, commander of U.S. and NATO forces in Afghanistan, puts a different spin on the withdrawal date, and then goes a step further and advocates talking to the Taliban. I must admit to being surprised when I heard the general make his remarks. I am of the opinion that we are pursuing the wrong strategy in Afghanistan - I favor less troops and a counter-terrorism operation aimed only at the bad guys, not the counterinsurgency operation recommended by General Petraeus and approved by the President earlier in the year. A counterinsurgency requires more troops, a lot of nation building and concurrent diplomatic activity, and inevitably means talking to the Taliban. General Petraeus is a brilliant strategic thinker, but I think he is wrong on this one. This is not Iraq, these are not Arabs - they are Pushtuns who have absolutely no code of honor except Pushtunwali, loyalty to the Pushtuns. They cannot be trusted - the Pushtuns who have joined the Taliban are true believers. The only way to deal with them is to hunt them down and kill them - you cannot talk to them. As far as the withdrawal date, the general's spin was nearly world class. He said that date was a transition date, not necessarily a withdrawal date - perhaps he and the Vice President should compare talking points. Until the President retracts his ill-advised politically-motivated July 2011 withdrawal date, the Taliban will continue to hold out until then. * For those not aware of the military chain of command, orders flow from the President to the Secretary of Defense to the Commander of Central Command (General Mattis) and then to General Petraeus. Note also the absence of the Chairman of the Joint Chiefs of Staff, who advises the President and Secretary of Defense. U.S. combat troops leave Iraq - politics or reason? 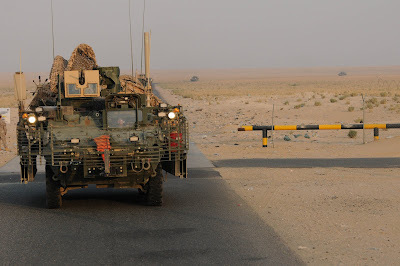 As the 4th Stryker Brigade Combat Team of the U.S. Army's 2nd Infantry Division rolls out of Iraq, representing the withdrawal of the final combat unit from the country ahead of the self-imposed politically-driven deadline of August 31, it might be useful to think about our future troop presence in Iraq and the Persian Gulf region. According to an agreement with the Iraqi government negotiated by the Bush Administration, all American troops will be out of Iraq by the end of 2011. Is that really in the national interests of the United States? Is that a smart foreign policy move? After removing Saddam Husayn and installing an elective government in Iraq costing us the lives of over 4,000 of our troops (and thousands more wounded), should we really just pack up and go home? I think we would be wise to reconsider that December 31, 2011 date. First, we should have never agreed to a specific withdrawal date - that merely tells your adversaries how long they must hold out and how strong - or not - your political will is. All withdrawal dates should be situation dependent - we should have been clear (isn't that one of President Obama's favorite concepts) that American troops will depart only when American goals have been met. Let's assume for argument's sake by December 2011 that the situation in Iraq will have improved to the point that the remaining 50,000 troops in country for the "advise and assist" mission are no longer required. Just because the Iraqi military and security forces might attain self sufficiency should not dictate that no American troops remain in Iraq. Our national interests in the region do not end with Iraqi forces completely taking over their own missions. The United States will still need a strong presence in the region. One only need to look to the east for maybe the primary reason - the ascension of Iran as regional power. If the Iranians are not convinced through sanctions and diplomatic pressure to halt their efforts to develop a nuclear weapon, and neither the United States nor Israel use military force to stop it, we will be faced with a nuclear-armed Iran sitting astride one of the world's most strategic waterways. Iran is cited by the U.S. intelligence community as the world's foremost state sponsor of terrorism. Acquisition of a nuclear weapons capability is not going to lessen that support, in fact, it may embolden the regime in Tehran to escalate its activities. We already see an Iranian hand in Lebanon, the Gaza Strip, Iraq, Afghanistan - they have also been in Chechnya and Bosnia in the past. Where will they start trouble next? Saudi Arabia? Bahrain? The UAE? About one-quarter of the world's oil flows from the Persian Gulf through the Straits of Hormuz and into the Gulf of Oman and Arabian Sea every day. As long as the United States and the rest of the industrialized world relies on oil to fuel their economies, not to mention the increasing appetite for oil in China and India, the Persian Gulf will continue to be of strategic importance to the United States. It is vital that we have influence in this area. Influence includes the ability to project power to protect our interests, and in this part of the world, that means a robust American military presence. While warships and aircraft are strong symbols of American power, there is nothing like the presence of American soldiers - or as some say, "boots on the ground." What better place than Iraq for a robust American military presence? There is plenty of room for prepositioned military equipment, training areas, and airspace, and it is centrally located if military forces are required anywhere in the region. As long as Iran remains a concern, there is nothing like an American presence on their western border in Iraq and on the eastern border in Afghanistan. We have invested a lot of blood and treasure to set Iraq up as a democracy (of sorts). We still have vital interests in the region. Why leave? President Obama's national security advisor, retired Marine Corps General Jim Jones, recently presented his views of the situation with Iran. I am sure the general was a fine Marine who has served his country long and well. While he may have felt at home on the battlefield, he is out of his league taking on the Iranians in the political arena. If he is the architect behind the President's Iran policy, it's time for the general to, in the words of General Douglas MacArthur, fade away. Let's take a look at what General Jones proposed just this week. It seems that he agreed in principle to a face-to-face meeting between President Obama and Iranian President Mahmoud Ahmadinejad. Whether he meant to give that impression or not is hard to tell - which in itself is a problem, there should be no ambiguity about our position. It was couched in such vague terms that it is sure to be viewed as a foreign policy success in Tehran. In a press interview, the general said "the door’s open" if the Iranians agree to resume talks with the International Atomic Energy Agency. Specifically he said, "Ultimately if we find a convergence of paths, all things are possible." I pretty much make my living with words, and that's pretty ambiguous to me. He continued, "One thing they might do is return our three hikers. That would be an important gesture. It could lead to better relations." Really - it could lead to better relations? How about demanding the immediate release of these three young people? Start acting like the superpower we still are and not some supplicant begging to be taken seriously. Every time we refuse to negotiate from strength, we lose a bit of stature in the eyes of the residents of the Middle East - they understand and respect power, and recognize and exploit weakness. See my earlier article, The three hikers in Iran - how's that "engagement" working? The general went on, "There is no point in a theatrical meeting." Does he really think that a meeting with Ahmadinejad would be anything else? Let me review for the general. The Iranians are in the midst of an expensive, almost all-consuming maximum national effort to develop nuclear weapons. A meeting with President Obama will not change that. The only reason Ahmadinejad would sit down with President Obama is to advance his chosen agenda - the nuclear program. He would certainly agree to it, but it would only be a tactic to buy time for the nuclear program. That brings us to sanctions. General Jones wants to give the sanctions more time to work. While there are indications that the 25 percent increase in the price of refined gasoline in Iran is having an effect, it does not seem to have slowed the nuclear program at all, which was after all the goal of the sanctions. Unfortunately, the United States and the Europeans may have overplayed the sanctions gambit by passing unilateral sanctions on top of the fairly weak United Nations sanctions protocols. The only reason the United Nations was able to pass any sanctions at all was the acquiescence of the the Russians and Chinese, who were generally opposed to the idea. To gain the votes of these two veto-wielding permanent members of the Security Council, there were a series of back room deals exempting Chinese and Russian companies from any future unilateral American sanctions. (See my earlier piece, Iran sanctions and the backroom deals....) When the Europeans passed their additional sanctions as well, the Chinese and Russians took offense. During the campaign and first 18 months of the Obama Administration, we were promised "crippling and biting" sanctions on Iran. What we saw instead this week was the Russian oil company LUKOIL resuming gasoline sales to Iran. Not to be outdone, the Chinese state-run oil firm Zhuhai Zhenrong also entered into contracts with Tehran. Hardly crippling. General, here is what you should not tell the Iranians: The United States has enough "wiggle room" - that must be the technical term - to give sanctions time to work against Iran before turning to the military option. This Administration just loves to tell other countries and adversaries when and when we will not conduct military operations. We've done it repeatedly in Iraq and Afghanistan - and always to our detriment. It gets worse. General Jones reiterated the offers made by the President and his Secretary of State Hillary Clinton that the United States was willing to return to negotiations over Iran's nuclear program. This is exactly the same mistake as suggesting the Iranians release the three hikers. It makes us look weak. Now is the time to tell the Iranians that they must comply or sanctions will continue. If that does not work, tell Ahmadinejad that there will be consequences. As I have said on several occasions, here is how to "negotiate" with the Iranians. Simply state, "We will not allow you to develop a nuclear weapons capability." 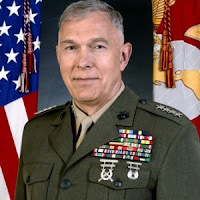 If what we read in the press this week is the type of Iran strategy General Jones is advising, then we should honor the general's 40 years of service to this country, but it is time for him to move on. The Iranians have outmaneuvered you, again. A few days ago I published an article with the title/plea Lebanon - Let's not overreact, hoping that our representatives in Congress would not do something that plays right into the hands of our enemies. Unfortunately, there are a few uninfomred souls who do not subscribe to Middle East Perspectives. Less than a week after the border clash between soldiers of the Lebanese Army and Israel Defense Forces, at least two members of Congress have chosen to overreact. 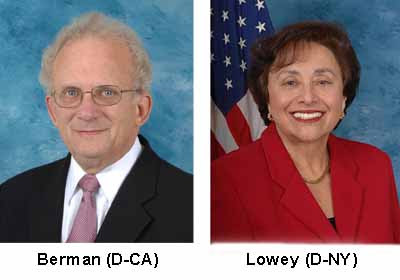 Two prominent Democrat Jewish members, Howard L. Berman (California), chairman of the House Foreign Affairs Committee, and Nita M. Lowey (New York), chairwoman of the Appropriations subcommittee on foreign operations, froze military aid to Lebanon because the money provided by the United States might be used to buy arms that could be turned against Israel. Berman said, "I cannot in good conscience allow the United States to continue sending weapons to Lebanon." The argument fails on many levels, but just a few here before I move on to the real problem with this knee-jerk reaction. First, money is a fungible commodity. If the Lebanese are going to buy weapons, they will use money from other sources and not the American-provided money. The net result is the same. Secondly, I am sure the Lebanese do not have weapons designated to be used against specific targets, like this batch of rifles will only be used against Palestinian extremists, this batch against Hizballah, etc. It is as ridiculous as it sounds. "If some of these representatives in Congress have their way and the assistance is not provided to the Lebanese armed forces and government, where will they turn for money, weapons and training? No doubt this will force them even more into the sphere of influence of Syria and Iran. The key beneficiary here will be Hizballah, already arguably the key power broker in the country." Not one day after the pronouncement by the two representatives, Iran announced that it would make up the shortfalls created by the loss of the American aid. Iran's ambassador to Lebanon, Ghazanfar Abadi, told Lebanese army chief Jean Kahwaji that Tehran was renewing their offer to replace all U.S. aid to the country. The Lebanese defense minister basically told the United States to keep any money that comes with conditions. It's a smart move for Iran. Lebanon needs the $100 million promised by the United States to maintain and upgrade its army. Allowing Iran to fill that vacuum is abandoning the army to the primary sponsor of Hizballah. This will be yet another step in Hizballah becoming the key power broker in the country. It's not a real smart move for the United States. If the United States chooses not to have a role, it is ceding all of its influence in Lebanon directly to Iran. As with its nuclear program, Tehran seems to have outmaneuvered the Obama Administration once again. The Obama Administration plans to sell 84 F-15 Eagle jet fighters to the Kingdom of Saudi Arabia over the next ten years for a total of $30 billion. I am sure that is welcome news for Boeing Defense, Space and Security. The news didn't go over so well in Tel Aviv, but as with most of these arms sales to Arab nations, the Israelis were consulted beforehand. This sale does not include the most advanced avionics and weapons, allowing the United States to keep its commitment to help Israel preserve its qualitative edge in weaponry. Much of the Israeli concern over the Saudis acquiring a fighter that made its U.S. Air Force debut over three decades ago is theatrical. The Israeli Air Force is set to acquire the new F-35 Lightning II fighter when it becomes available at about the same time the Saudi F-15's will be delivered. The F-35 is one of the most capable and sophisticated combat aircraft ever developed. 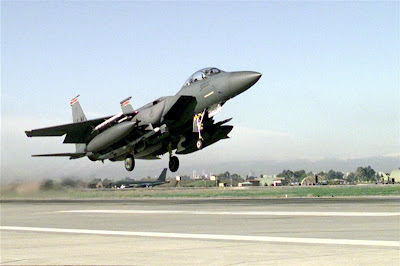 The announcements of the sale did not specify which version of the F-15 was to be sold, but if other statements such as "useful in the fighting in Yemen" are any indication, they are likely referring to the F-15S, the made-for-Saudi version of F-15E Strike Eagle two-seat fighter bomber that has been very successful in U.S. Air Force service. Even with downgraded avionics and weapons, this buy would provide much-needed additional ground attack fighter bombers for the 72 F-15S Strike Eagles currently in the Royal Saudi Air Force inventory. The sale follows other multi-billion dollar arms deals with Gulf Arab states. Earlier this year, the United Arab Emirates announced it was going buy both the Patriot air defense system as well as the new Terminal High-Altitude Area Defense (THAAD) system. Both represent a credible capability against the growing Iranian ballistic missile threat. Beefing up the military capabilities of the Gulf Arab states is not a bad idea - I fully support it. I have served in all of these countries and their military forces generally work well with their American counterparts - the cooperation is especially strong in the air forces. That said, I think we are treating the symptom - the threat from a nuclear armed Iran. We should be treating the problem - the continuing Iranian quest for a nuclear weapons capability. It sounds very similar but it is not. The Administration appears to be willing to deal with a nuclear armed Iran and is encouraging others in the area to do the same. What they should be doing is preventing the Iranians from acquiring a nuclear weapon. After eighteen months of floundering and hesitation, the Administration finally was able to get a weak sanctions protocol passed in the United Nations. The United States and its European allies passed additional sanctions which, ironically, have threatened their effectiveness. Russia, China and India, in a backlash to the enhanced sanctions, are making deals with the Iranians. Here is the part I find hard to believe. Just when the sanctions were starting to have some slight effect, the Administration announced that it still wanted to sit down and talk to the Iranians. Yes, sit down with the likes of Mahmoud Ahmadinejad who just a day ago denied the Holocaust and said that the United States had overestimated the death toll of the attacks of September 11, 2001. 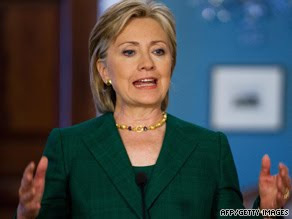 Mr President, Secretary Clinton, your outreach to the Iranians - misguided, in my opinion - has failed. They have rebuffed every attempt to have a serious dialog. At some point you have to admit that they do not want to talk to us - they are intent on developing a nuclear weapons capability. Any seeming willingness to talk or negotiate with you or the West is merely a tactic to delay sanctions or military action while they continue to enrich uranium. IF you insist on talking to the Iranians, then do just that - talk TO them, not with them. Use small, easy to translate words (as a former interpreter, trust me, this is important). How about, "We will not allow you to have a nuclear weapon." There's no need to say much else - that's pretty self explanatory. Let them figure out the rest. Tariq 'Aziz was the former deputy prime minister of Iraq under Saddam Husayn. When I was in Baghdad as a liaison officer to the Iraqi Directorate of Military Intelligence in 1988, 'Aziz was also the foreign minister of the country and an integral part of the decision to accept U.S intelligence support during the last year of the Iran-Iraq War. Some background might be useful. Tariq 'Aziz was born Mikhayl Yuhanna in a suburb of al-Mawsil (Mosul). As you can tell from the name, he is not an Arab, but an Assyrian, nor is he a Muslim - he is a member of the Chaldean Christian Church (affiliated with the Roman Catholic Church). Those two factors were partially responsible for his rise in the Ba'th Party and in the regime of Saddam Husayn. There was no way that a non-Arab Christian was going to pose a threat to the continued rule of Saddam Husayn. He himself could not assume the leadership position, and his gratitude for his position guaranteed loyalty to the dictator. 'Aziz's protestations to the contrary, Saddam Husayn was a dictator of the worst order. Okay, I said that I was in Iraq providing American intelligence to the Iraqi armed forces during the last year of the 1980-1988 Iran Iraq War. If Saddam was a "dictator of the worst order" as I describe him, then what were we doing as a country assisting him? For the long answer, I refer you to my book, Ally to Adversary An Eyewitness Account of Iraq's Fall from Grace (Naval Institute Press, 1999). In the "small world" category, when Tariq 'Aziz's house in Baghdad was raided by U.S. Army troops in 2003, they found a copy of my book in his library. I think I'll take that as a compliment. The shorrter answer - it was not about Saddam Husayn and Iraq, it was about the Ayatollah Khomeini and Iran. By 1987, the war had been raging for seven years and was a bloodbath on both sides. It was obvious to military analysts at both the Central Intelligence Agency and the Defense Intelligence Agency that if the war continued into 1988 and the Iranians launched their expected spring offensive, Iraq would lose the war. President Ronald Reagan decided that an Iranian victory in the war - and its repercussions in the region - were unacceptable outcomes for American foreign policy. He directed that the Defense Department begin providing intelligence to the Iraqis to make sure that Iran did not win the war. To that end, another officer and I made our way to Baghdad overland via Kuwait and up the roads in southern Iraq crowded with military traffic. When we reached Baghdad, we met with the deputy director of military intelligence Brigadier Wafiq al-Samarra'i. (Al-Samarra'i defected to the West after Desert Storm and joined the opposition). We proposed to provide intelligence assistance to the Iraqis - it took a few days to receive an answer. The delay was the decision process involving Saddam Husayn and Tariq 'Aziz. They agreed and we began the intelligence support that - along with Iraq's deplorable use of chemical weapons - turned the tide of the war. Recently, 'Aziz gave his first interview since his arrest. Not surprisingly, he claims that the West (read the United States and the United Kingdom) has misjudged Saddam Husayn. In his words, "He is a man who history will show served his country." He also said Iraq was now much worse off. I guess that all depends on your perspective and who you ask. The Kurds are certainly better off - there is no more t'arib, the Arabization program that forced them to use Arabic as their official language, resettled thousands of Kurds to the Shi'a south and thousands of Shi'a to the Kurdish north, no more chemical agent attacks such as that at Halabjah in 1988 in which thousands of Kurds died. We discovered later that the attack was a test of the weapons later used against Iranian troops. I guess if forcibly uprooting thousands of citizens or using them as human guinea pigs is serving your country, Saddam certainly served. Despite the rhetoric of radical Shi'a cleric Muqtada al-Sadr, the Shi'a Iraqis are much better off without Saddam Husayn. It was the Shi'a youth that bore a disproportionate share of the casualties in the Iran-Iraq and Gulf wars. Before the overthrow of Saddam, they had little input into the political system that ran the country - now they hold the majority. The two men competing to form a new coalition government and serve as prime minister are both Shi'a - both had been persecuted (and one almost assassinated) under Saddam Husayn. I guess Tariq 'Aziz also considers that service to his country. Perhaps some of the Sunni Arabs are not better off now that Saddam Husayn and the Ba'th Party are gone, but they probably deserve their fate. Other Sunnis, including the tribes in the areas north of Baghdad and south of the Kurdish area, are certainly better off. All that said, Tariq 'Aziz is an astute man. He does agree with me on an issue that I have written about before - the withdrawal of American combat forces from Iraq based on a politically-imposed timetable rather than the security situation in the country. See my earlier piece, Differences in the Iraq casualty count - math or politics? Like me, he believes that pulling out combat units before the country is stable is a mistake, in his words, "leaving Iraq to the wolves." Tariq, you have good taste in literature, to be sure, and you understand that a politically driven withdrawal date is a mistake, but your romanticized memory of the Iraq under Saddam Husayn defies reality. Maybe you can sell it to someone who never lived in Saddam's Iraq, but don't try to sell it to me - I saw what Saddam Husayn (and you) did to the country and its people. Of course, you still have 14 more years as a guest of the new Iraqi government to reflect on that. The recent border clash between soldiers of the Lebanese Army and the Israel Defense Forces (IDF) highlights the fragile cease-fire in place there. It's pretty clear what happened. Several Israeli soldiers used a crane to trim a tree that was preventing observation into Hizballah-controlled southern Lebanon. The tree, although on the outside of the border fence, was still located in Israeli territory. The fact that the tree was in Israeli terrirtory was confirmed by the United Nations. As a friend of mine remarked when he read the story, when the United Nations backs the Israeli version of events, you know it must be true. In response to the tree-trimming, Lebanese soldiers fired on the Israelis; the Israelis returned fire. Three Lebanese soldiers and a journalist were killed on the Lebanese side, while one Israeli officer was killed and another wounded. It is easy to understand how these seemingly minor events - trimming a tree - can lead to an international incident. The Lebanese saw an Israeli crane on what they perceived to be on Lebanese territory - a logical assumption. 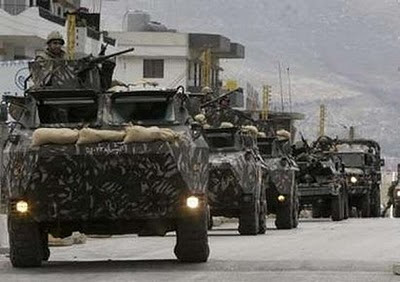 United Nations observers from UNIFIL (United Nations Interim Force in Lebanon) warned the Israelis that the Lebanese claimed a violation of the border. The situation along that border is an incident waiting to erupt, and on this day, it did just that. According to press reports from Lebanon, the Lebanese army officer in charge of the area in which this incident occurred is a Shi'a Muslim and an avowed supporter of Hizballah. Americans may find it curious that the press would report a military commander's religious affiliation and political leaning, but in Lebanon, it's normal. Sectarian divisions have caused problems for the country since its inception by the French in the aftermath of World War One. Now we have some representatives in the U.S. Congress demanding that we re-assess our support of the Lebanese armed forces. Since the end of the war between the IDF and Hizballah in 2006, the United States has provided almost three quarters of a billion dollars worth of aid to the Lebanese. That aid includes military equipment, training and humanitarian assistance. In FY2010, the United States allocated $100 million in assistance to the Lebanese armed forces, plus $109 million in economic (non-military) aid as well as $20 million to support Lebanese anti-drug efforts. The Obama Administration has proposed slightly more for FY2011. While the United States is providing this money to the Lebanese, Iranian and Syrian backed Hizballah is growing stronger as both a political party and as a militia that many observers believe is more capable than the Lebanese Army. They are certainly more committed and have more combat experience. Since the end of the war in 2006, despite UN Resolution 1701 that demands the disarmament of Hizballah and a pull back from the area south of the Litani River, Hizballah is deployed in force throughout southern Lebanon and now has more rockets and missiles than at any time since its founding by the Iranian Islamic Revolutionary Guard Corps in 1982. If some of these representatives in Congress have their way and the assistance is not provided to the Lebanese armed forces and government, where will they turn for money, weapons and training? No doubt this will force them even more into the sphere of influence of Syria and Iran. The key beneficiary here will be Hizballah, already arguably the key power broker in the country. Are we willing to cede that to them? If so, halt the assistance and write Lebanon off as what the Syrians already call it - al-muhafazih, "the province." The Fourteenth Amendment to the Constitution of the United States has three clauses - this is about the citizenship clause. It's pretty specific, "All persons born or naturalized in the United States, and subject to the jurisdiction thereof, are citizens of the United States and of the State wherein they reside." Most of us take our American citizenship for granted. Through some force of nature or whatever deity you acknowledge, most of us were afforded the rights of American citizenship by birth in the United States as provided in the Fourteenth Amendment. The amendment does not specify the status of the parents - all it says is that if you were born here, you're a citizen. Courts have held on several occasions that the children of persons in this country illegally are American citizens by birth. 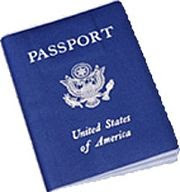 The same rules also apply to persons here as students or as a result of their official duties for their home countries. Many children of foreign military members and diplomats enjoy American citizenship. You may remember a few members of al-Qa'idah who were captured in Afghanistan whose parents had been students at American universities when they were born - these jihadists had to be moved from incarceration at Guantanamo to U.S. prisons and afforded all the legal protections of American citizens. There are hundreds of foreign military personnel attending training courses at military installations around the country. Many of them have children while here - these youngsters are American citizens by birth. I was reminded of this while assigned to the forward headquarters of the United States Central Command in Saudi Arabia during Operations Desert Shield and Desert Storm. 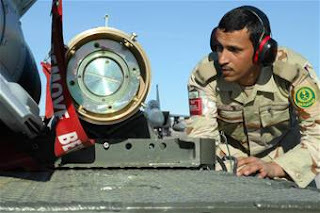 Soon after I arrived in Riyadh and assumed my duties as General Schwarzkopf's Arabic interpreter and liaison officer to the senior Saudi staff, several of the Saudi officers (and one Egyptian) in the Command, Communications, Coordination and Integration Center (C3IC) sought me out - I had garnered the nickname as al-amirki min yahki 'arabiyah mithl ibn balad (the American who speaks good Arabic). I took that as a compliment, although I knew at times they made fun of my Syrian/Lebanese accent. Since I spent a lot of time chatting with them in Arabic, they felt that they could ask me questions that might be regarded as sensitive - and they did. One of the questions was about American citizenship. I was a bit puzzled by the question - were they looking for a civics lesson? I was soon to realize why they were asking and why it might be regarded as sensitive. They had heard that being born in the United States made you an American citizen. I said that was my understanding. They asked if it applied to their children born at military hospitals in the United States while they were in various training courses. I said that I was pretty sure that it did, but that I would check to make sure. I called a friend at the defense attaché office American embassy in Riyadh, who confirmed it with State Department - the children born in the United States were in fact American citizens. I reported this back to the officers. A few days later, a Saudi brigadier general pulled me aside and handed me his daughter's birth certificate issued at the William Beaumont Army Medical Center, Fort Bliss, Texas. He asked if this was sufficient documentation to prove that young Hala, now 12 years old, was an American citizen. I told him I thought it was. My friend at the embassy gathered the forms, I had the general fill them out and in about ten days I handed him a U.S. passport in his daughter's name. Then came the sensitive part. He asked if Hala could travel to the United States, were there visa requirements or more forms needed. I explained that Hala was an American citizen just like me, and could travel to and from the United States as she pleased. I knew where this conversation was going. Many Saudi officers were looking for a way out of the Kingdom for their families. They knew that at some point in the near future we all would be in a shooting war with the Iraqis, and the Iraqis had missiles capable of hitting Riyadh. I can't say I blamed them for that. The general looked at me and said, "She is 12 years old - she cannot travel alone. My wife must accompany her. And if my wife goes, the other children...," ending with the Arab "what can be done?" shrug. In the end, we arranged visas for the wife and children. I was happy to do it - Hala is an American citizen, by birth. Her parents were in the United States legally when she was born. Differences in the Iraq casualty count - math or politics? 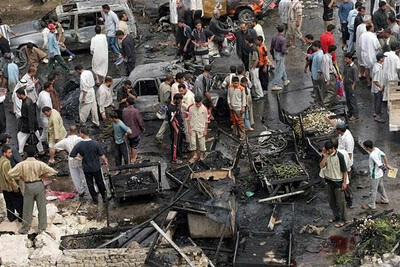 According to Iraqi government figures - and you would assume they are in the best position to know - July 2010 was the deadliest month since 2008 with over 500 dead and almost 1,000 injured as a result of increasing violence. Yet, the United States government - well, the Obama Administration - has taken issue with those figures, claiming that the real numbers are closer to 220 killed and less than 800 wounded. If the American military counts casualties as accurately as the Obama administration counts jobs saved or created, there may be a credibility issue. We've never been good at body counts - remember Vietnam? In Operation Desert Storm, those of us from the Vietnam era were thrilled with General Colin Powell's and General Norm Schwarzkopf's decision not to count how many Iraqi soldiers we killed. Despite the counting methodologies, the fact remains that the violence in Iraq, which had been on the decline since the American troop surge that began in 2007, has begun to rise over the last few months. There two key factors that account for this - the withdrawal of American combat forces according to an announced timetable, and the failure of the five major Iraqi political parties to form a government in the wake of the parliamentary elections held in March. The insurgents - be they the remnants of al-Qa'idah in Iraq (AQI) or others - are taking advantage of the resulting power vacuum to assert their relevance. The two factors symbiotically contribute to the increasing violence. First, as any military officer will tell you, announcing timetables for military operations is never a good idea. Adhering to them in spite of a deteriorating security situation on the ground is even worse. The insurgents know that this is the one campaign promise President Barack Obama will keep. American line units, the brigade combat teams with overwhelming firepower and maneuver elements, are being removed from the fight. This leaves the primary defense duties in the hands of the Iraqi army and security forces. While these units have made substantial progress over the last few years, they are not trained, disciplined and tested American troops. The insurgents know that their time is now, but that this opportunity will not last forever. It is the second factor that dictates how long the window of opportunity for the insurgents remains open. As long as Iraqi politicians cannot or will not form a government, there is a huge power vacuum in Baghdad. No one is making policy, no one is executing policy, and no one is directing the defense of the country. It's the "perfect storm" for the insurgents - American troops (through no fault of their own) are being withdrawn without adequate concern for the security situation, and there is no Iraqi government standing up to take the reins and take the fight to the enemy. A major part of this fight is national will. If I was an Iraqi insurgent, whether from the AQI or elements of the resurgent Ba'th Party, I would assess that the Americans do not have the national will to alter their set-in-stone withdrawal date because of a domestic political agenda, and the Iraqi leaders (and I use the term loosely) do not have the national will to reach a political compromise in governance that will lead to effective security in the country. Back to the numbers. It is in the Obama administration's political interest to have lower casualty numbers than what the Iraqis claim are the actual figures. If the administration can convince the American public that there is no serious increase in violence, there is no reason to reassess the security situation that might delay the pullout of combat troops from Iraq. Politics is driving this train. That's cynical, but believable. The three hikers in Iran - how's that "engagement" working? The three American hikers have been held by the Iranians for one year now. They were arrested for illegally entering the Islamic Republic in 2009 while on a hiking trip in northern Iraq - the Iranians claim that the trio intentionally crossed the border into Iran. I have been in that area of northern Iraq, in fact, to that same spot where the incident took place. The border is clearly marked, and there are Iranian troops and guards present. We don't know exactly what happened, but the intentional entry into Iran is a bit far-fetched. It must be a recurring problem for the Iranians - people wanting to move to an oppressive, Shi'a Islamist theocracy run by a arguably unbalanced leadership. In any case, the Iranians have stated their intention to put the three on trial, although not for espionage as earlier threatened. The detention of the these three young Americans raises the question of just what their government is doing for them. It used to be that if you as an American citizen were improperly detained abroad, you could feel confident that the government would take whatever steps necessary to gain your release, or at least ensure that you are properly and legally treated. Today? Not so much. Just what signals do we get from the current administration about this issue? President Obama strongly reiterated his previous statement that the three are "guilty of nothing, have never worked for the U.S. government and never had any quarrel with the Iranian government." I know, you are shocked and surprised that the three are still in Iranian custody after that powerful statement. Candidate Obama campaigned for the presidency on his plan to "engage" unfriendly regimes, specifically Iran. Obama consistently uses the term "Islamic Republic" when referring to the country, something previously not done by American presidents. I use it in a pejorative manner; this administration does not. So what is the problem? Obama is now the President, and he has a like-minded appeaser as his Secretary of State. Hillary Clinton campaigned in the presidential primary with the clever ad (although it backfired - she lost) asking who you would want to answer the phone at 3:00am when there is a crisis. Well, Mr President and Madame Secretary - the phone rang a year ago, and your answer was obviously unimpressive in Tehran. Three American citizens are still in peril at the hands of the Iranians. I have to ask - how is that engagement with the Iranians working for you? Actually, the more important question is how is that engagement working for the country, how is it working for these three Americans? Call me skeptical, but I would assess it as not working at all. Engagement has failed, and the sanctions have only been moderately effective. The Chinese and Russians are basically ignoring them, and the Iranians continue to enrich uranium. Perhaps had you been successful in imposing the "crippling and biting" sanctions that you promised, the Iranians would be at the table right now. Instead of holding three Americans as virtual hostages, they might be discussing their nuclear program rather than playing you for the patsies you appear to be. It has been over eighteen months since you took office and promised to do something about the Iranian nuclear program - of course you thought your diplomatic skills and reliance on your supposedly foreign-policy astute vice president would do the trick. Nothing has changed. Well, that's not exactly correct. It is true that the Iranians are still promising to talk - that's all they ever do. What has changed is their nuclear program. Every day that you don't successfully convince them - via sanctions or force - to halt their uranium enrichment activities or open their program to international inspection, they are closer to having a nuclear weapon. It was refreshing to see the Chairman of the Joint Chiefs of Staff Admiral Mike Mullen admit that there is a plan for military action against Iran, albeit couched in the typical warnings against it. These half-hearted acknowledgements don't fool the Iranians. They have assessed - probably correctly - that the current American administration is unlikely to do anything meaningful to stop them from acquiring a nuclear weapons capability. Why shouldn't they believe that - this administration can't even engineer the release of three innocent young hikers.